provides FREE professional estimating services for roof replacements using the latest computer software and technology to ensure accuracy. 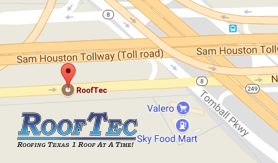 Providing free roofing estimates in Houston TX with guaranteed quality, whether you need a new home roof or a roof replacement. will provide you with a free roof install estimate. Schedule your free roofing estimate below. Note: *Roof repair estimates require a $95 assessment fee due at the time of the estimate and may be used towards the repair of your roof.